“…A great amphitheater with a picturesque marine view.” What a lovely description! 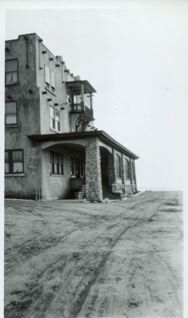 Frank Brophy insisted that his “Princeton-by-the-Sea” was the grandest beach resort on the entire Pacific Coast. 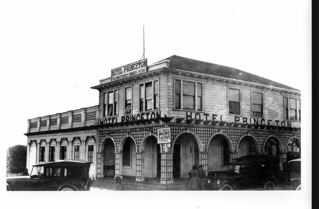 Under his auspices, the charming Hotel Princeton was constructed. A posted sign advertised that the new restaurant speciallized in fresh fish and Italian dinners available “at all times”–which was very convenient a few years later during the colorful, rowdy Prohibiton era. Nearby “Princeton Park” became famous for its large dancing pavilion, measuring 60′ x 125′–and even more for its carnival atmosphere with challenging games and silly amusements. But inevitably the flurry of building activity that energized the Coastside in 1912 subsided. Simultaneously, the pace of Ocean Shore Railroad service slowed down and eventually ceased. The reason: Real estate interest was now focussed on the busy San Francisco Peninsula. In the meantime, the profitable Stine and Kendrick partnership broke-up, and Charles Kendrick went on to fufill his destiny in the upper echelons of business, commerce and politics. The other developers of the 1912 Coastside boom faded from the pictyure. Most of their buildings are gone as well.